In this fun farm game you have established a new farm in Russia. It is very fun to be a farmer, especially when you know you will have a nice profit at the end, that is, if you manage to complete all the levels of the game in as little time as possible. You will receive different goals on each level and you need to make sure that you succeed in collecting that number of eggs, buying a certain amount of new animals and so on. Try to plant grass on the ground so the animals will have something to feed off and they will lay eggs for you to collect and eventually sell. When you have enough money, you can start buying machines, that will turn raw materials into finished products, so you can take them to the city and become rich for selling them with a nice profit. 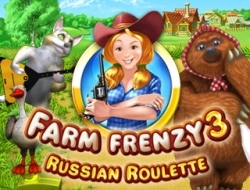 Farm Frenzy 3 Russian Roulette 9.60 between 0 and 10 based on 5 votes.